Developing eye tracking applications requires a thorough understanding of eye tracking technology and devices as well as an important investment in terms of development. This is a strong barrier to entry for those who approach this technology to assess the potential for an integration in their product. Starting from this consideration, we worked to break down these barriers by giving the possibility to anyone to quickly design and build gaze-controlled applications. Considering the growth of the use of eye tracking in embedded devices, we decided to integrate our technology with the #QT framework. #QT is used to develop embedded applications in automotive, automation, medical, entertainment, etc., by 8 of Top 10 Fortune 500. The integration with QT Quick allows to design and build your graphical user interfaces through the QT Designer. You can compose and customize interfaces in a what-you-see-is-what-you-get (WYSIWYG) manner, and test them using different styles and resolutions. DeepGlance Explorer was entirely designed and developed using using this technology. 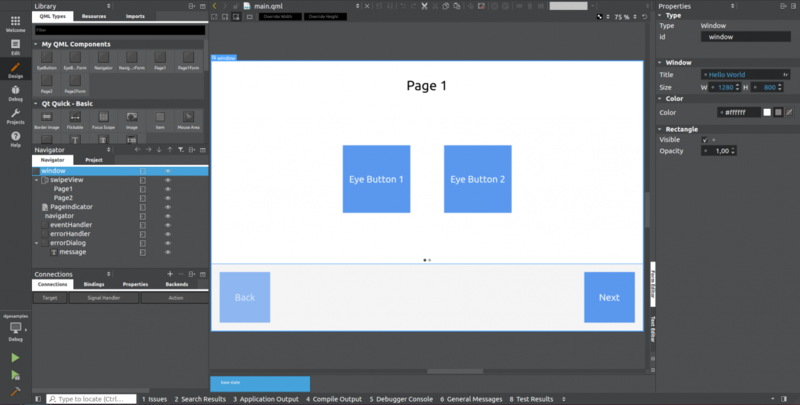 In this first example, it is shown how to create buttons that are activated by focusing the gaze and how to use them to select and for browse the application pages. Get the source code and start designing eye controlled applications.